Coffee is one of the world’s most beloved beverages, but did you know it originally comes from Ethiopia? There are now quite a few famous coffee-growing regions around the globe, and I must confess (with some embarrassment) that I had previously thought coffee originated in the Americas, home to many of the foods now essential to the global table. Ethiopia dates its creation as a country to about 1,000 BC, to a legendary union between the Queen of Sheba and King Solomon of Jerusalem that produced the Solomonic royal house, which ruled Ethiopia for most of the next 3,000 years. Amazingly, in all those millennia – even as the rest of the African continent was being carved up by the European colonial empires — Ethiopia lost its independence only once, when it was occupied for about five years by Mussolini’s Italy. Around two-thirds of Ethiopia is highland, and the temperature is a comfortable 24°C year-round on average. The spring-like conditions, too, separate Ethiopia from the standard image of Africa. To find out more about this country, it’s culture and its cuisine, we visited with Ethiopian Ambassador to Japan Markos Tekle Rike and Madame Hiwot Tuffa, who have graciously invited us to their Tokyo home for a sumptuous Ethiopian lunch and conversation about their country. On the couple’s dining room table sits a tall woven basket in pinks and blues and yellows, and nestled atop it is a broad plate filled edge-to-edge with a grey flatbread playing the role of palette to a veritable rainbow of stewed dishes. Once again, I’m a little embarrassed to say that, when I first saw the flatbread, I wondered how I was supposed to use it. 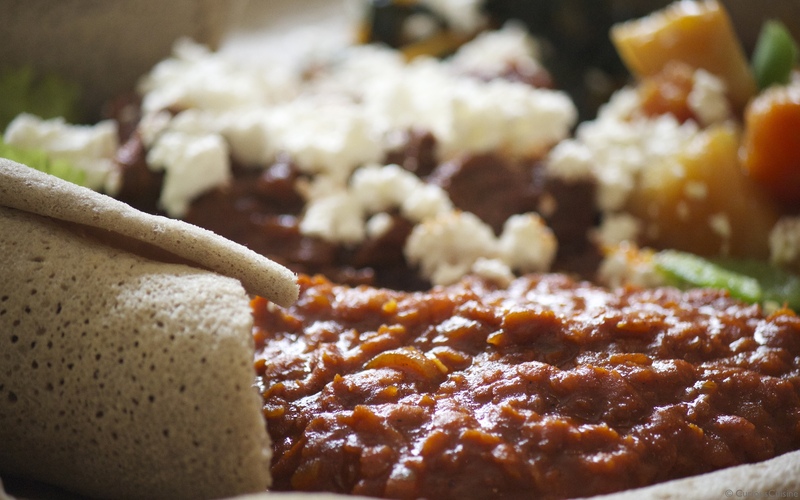 This flatbread is called injera, and it’s an Ethiopian staple made from teff, a local grain. The teff is ground into flour, mixed with water and fermented, and then the batter cooked. Perhaps you’ve heard of teff before; it’s been tabbed as an extremely nutritious “superfood” overseas as well. As high a reputation as it may have, however, teff is still apparently quite difficult to find outside its native land. Back at the table, we are curious to find out the manners and technique for eating injera. It’s quite spongy, and there is more of it in neat little rolls alongside the stewed dishes. A smiling Ambassador Markos comes to the rescue with a deft demonstration. With a pair of tongs he plucks one of the rolls from its serving dish and unfurls it on his plate. He does this several more times, until the white porcelain of the plate has disappeared under a carpet of injera. 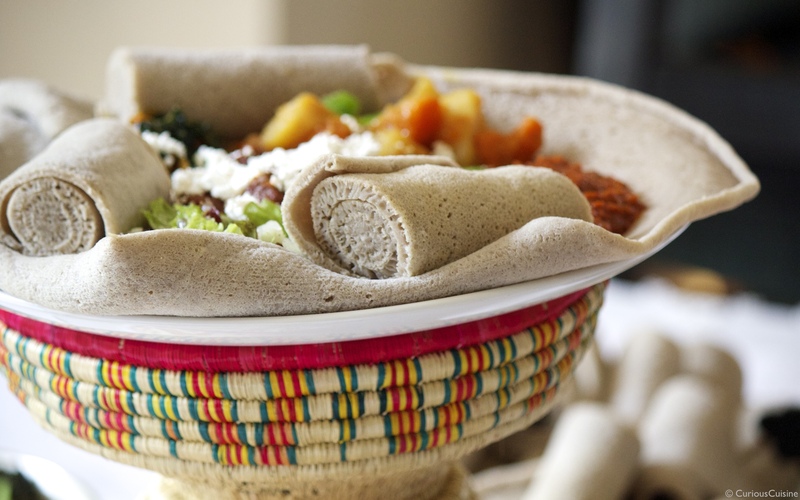 Flatbread foundation complete, the ambassador spoons a selection of the colorful stewed dishes onto it from bowls set between us, turning his grey injera bright and colorful. There’s a dark red beef stew called Siga or Key Wat, a deep orange lentil dish called Misir Wat, chunky vegetables stewed in turmeric called Alicha Wat, and a smooth spinach dish the green of a pine forest called Yetetebese Gomen. There’s also a side of strikingly white homemade cottage cheese, ready to supplement all the days flavours with its rich and creamy accents. Madame Hiwot and Ambassador Markos tear of palm-sized portions of injera and smoothly scoop up mouthfuls of each dish, nary a drop amiss. we watch their technique carefully, and give it a try. The couple asks if we mind eating with my hands like this. In fact, we have no qualms about it whatsoever; far from it. In fact, I tend to think eating with one’s hands bumps up the flavour and satisfaction level, and it’s a common feature of many of the world’s cuisines. Japanese sushi, for instance, is traditionally eaten with your hands. Then there are American hamburgers, European sandwiches, Mexican tacos, and Korean barbeque wrapped in leaves. And just about anywhere there is bread, it’s eaten by hand. I think perhaps we as human beings feel a certain warmth holding food in our hands. 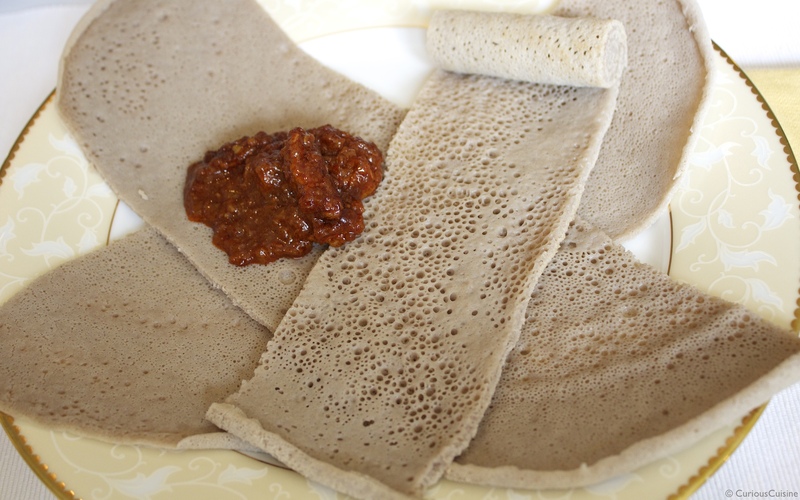 Today’s injera is just as satisfying to have in the hand, and in the mouth it’s soft and a touch sour; no surprise since the batter is fermented. The touch of tartness also adds a fresh accent to the deep tones and refined spice flavours of the dishes. 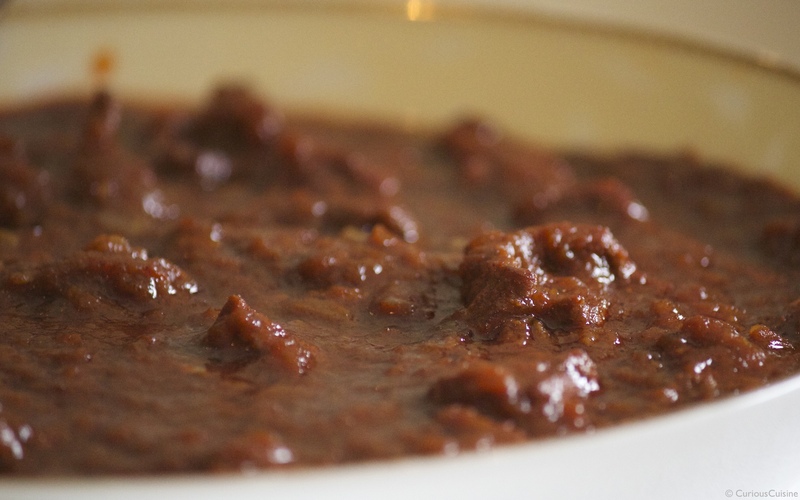 According to Madame Hiwot, the Wat stewed dishes often have a blend of seven spices – black pepper, cumin, dried ginger and garlic, clove, cinnamon and nutmeg – called Mekelesha. 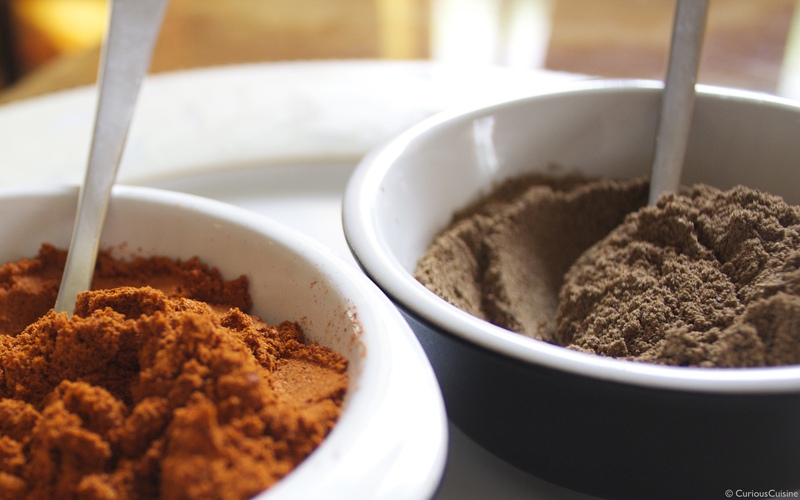 Anyone looking for more heat in their meals will add Mitmita, a type of chili powder. 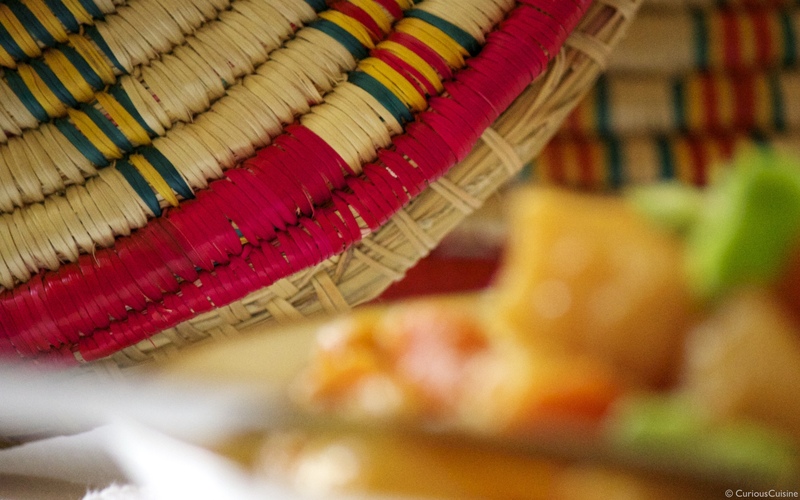 A few bites into our lunch, Ambassador Markos asks if we’d like to try some Ethiopian wine. He quickly adds that he also has some French bottles if we’d prefer, but we quickly and enthusiastically elect for the Ethiopian. Its bouquet and its first flavours are packed with stewed dry fruits that finish out smooth, refined and compote-like as the wine flows down the throat — an excellent companion for the spices of the stewed dishes. It’s often said that the best pairing for any food is the drinks made in the same region, and I feel that now on my tongue, in my nose, indeed spreading through my entire body. As we sip and eat, I choose this moment to ask the one question I always ask at these meals, simple but often revealing: If you have to choose only one thing, what do you personally like most about your country? “Diversity defined Ethiopia,” she goes on. Ethiopia “has come through many troubles, and it’s not that easy because of different languages, because of different culture.” Indeed, according to the Ethiopian government, there are no less than 86 ethnic groups in the country. “Today’s Ethiopia is built, like he said, in that history, through diversity,” Madame Hiwot continues. On top of this ethnic eclecticism is, Madame Hiwot says, a religious harmony she is obviously very proud of. Some 64 per cent of Ethiopians are Christian, and about 34 per cent are Muslim, with the remainder made up of local traditional creeds. Both Christianity and Islam came early to this land. There is, however, no tension between believers of the major faiths, Madame Hiwot says. Muslims and Christians often share in each other’s festivals, and the ambassador says that intermarriage is not uncommon. Culturally rich and vibrant as Ethiopia may be, “our problem is because we are poor,” says Ambassador Markos. “I felt that if we could have more resources, more economy and more capacity, we could have registered so many (places) as a (UNESCO) World Heritage.” That is, though the country has nine World Heritage sites, it would likely have more if Ethiopia had the financial resources to do the necessary promotion. Ambassador Markos tells me about Ethiopia’s development and recovery efforts over the past some 20 years; efforts to overcome “Poverty shadowed our history, and our civilisation,” says Ambassador Markos. Especially the 1980s’ “drought and famine – it’s really damaged our image. … Because of that, we are now working to change that face of Ethiopia,” he goes on, and tells me of the intense recovery and development efforts of the past 20 years or so. He is also keen to emphasise the central role of the unity of all Ethiopia’s diverse peoples. “In our case, we say our identity is different … but the unity is there,” he declares. “So then we designed a constitution that embraces and celebrates diversity,” a document he says lays out ideas similar to the Swiss canton system. This peaceful integration stands in stark contrast to the tensions and conflicts we see in too many places around the world. Take religion for example. Both in the past and in the present, we see believers unable to tolerate the followers of another faith, and vice versa. In the worst cases, this intolerance bleeds into war. On the other hand, there are many examples from across time and place of people from different religions living and working together. Ethiopia is one of those examples, with Christianity, Islam and native religions all coexisting for more than a thousand years. If your family has practiced a different religion from its neighbours for centuries, but had always chatted with those neighbours at the market or over afternoon coffee, had for generations banded together with them to battle local problems or natural disasters, choosing to simply accept the other for what they are seems to me just a naturally human thing to do. There is a broad range of feelings between friendly interest and acceptance versus negativity and antipathy for people and things that are different from us, especially when they are close by. In the extreme, the latter can lead to confrontation and war. However, Ethiopians seem to have taken the path of the former. There, you can take pleasure being invited to different but tasty-sounding dinners by your neighbours, be a bit curious, try their food, have a nice conversation and enjoy the time together. The conversation turns once more from the deeper issues of ethnic and religious harmony to the delights of the table, as Madame Hiwot begins to prepare that essential Ethiopian contribution to the world’s food and drink culture: coffee. The room fills with the rich scent of the stuff as it warms inside a beautifully shaped pot — wide at the bottom and with a graceful narrow neck — called a jebena. 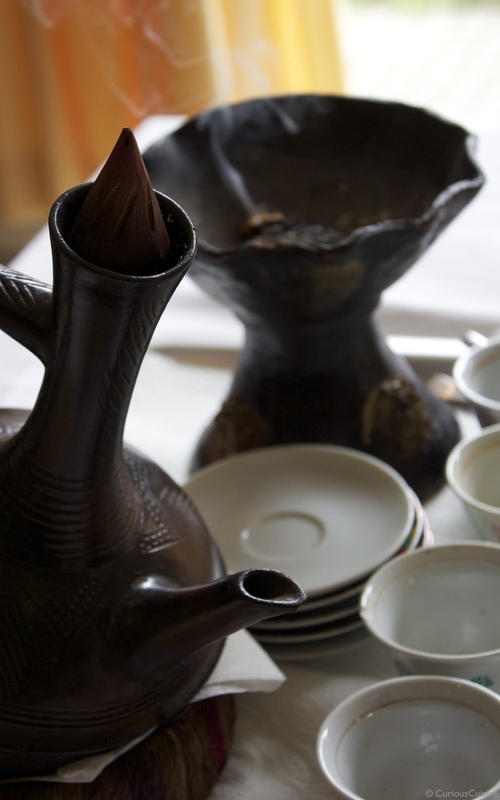 Madame Hiwot picks it up by its handle and pours it into handle-less cups, fragrant steam rising to meet my senses. But there’s more than the deep aroma of fresh coffee in that steam, and Madame Hiwot tells me that it has been spiced with ginger. Ethiopians, she says, often add spices to their coffee, ginger being her preferred flavouring though clove is also common. I take a sip, and my mouth fills with soft, smooth taste, finishing slightly sweet as the aroma rises up the back of the nose. 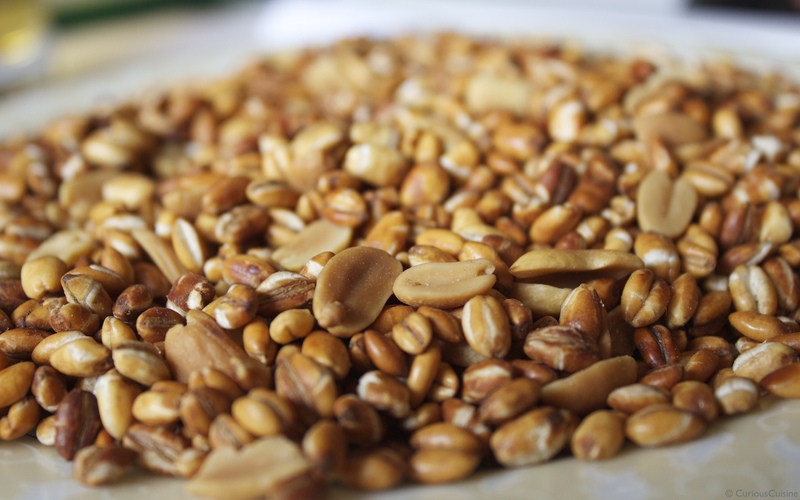 Next to our cups is a bowl of Kolo, a very crunchy mix of barley and peanuts often served alongside Ethiopian coffee. The taste, scent and even the look of the Kolo sparks a certain sense of familiarity in me as a Japanese person, similar as they are to the snacks that accompany drinks here. And it’s not the only thing. The soft and clear taste of my (second) cup of coffee, the shape of the cup, the gentle scent of incense rising from a wide clay vessel, the carefree conversation here at the end of the meal — all make me feel relaxed and light-hearted. These are the traditions of a country so very far from Japan, but they remind me in this moment of time spent as a child at my grandparents’ home, of us all sitting around a kotatsu heated table with teacups in one hand, the other reaching for the sweets set between us. We would talk and drink our green tea and gaze out at the garden. This time at the home of Ambassador Markos and Madame Hiwot, these minutes drinking coffee, snaking, talking, smiling remind me of those precious days years ago.